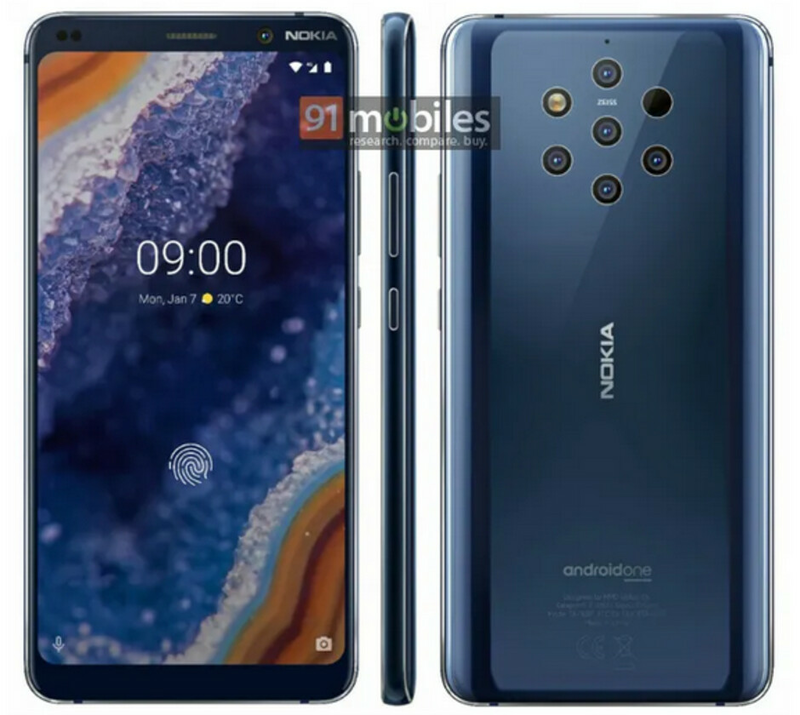 The Nokia 9 PureView has leaked a number of times already, and many of you are already familiar with the design of the handset's penta-camera setup. Today, 91mobiles published a new press render that gives us another look at the phone. In addition to the five camera sensors using Zeiss optics, there is an LED flash and an autofocus module. That means that there are seven cutouts on the back of the handset. Besides a high MP sensor to be used as the phone's primary camera, we could see a wide-angle camera, a telephoto camera, a monochrome sensor and a depth of field sensor for the bokeh effect. Other rumored specs include a 5.99-inch AMOLED display with a 1440 x 2880 resolution and an 18:9 aspect ratio. The Snapdragon 845 Mobile Platform is believed to be under the hood along with 8GB of RAM and 128GB/256GB of native storage. Besides the five cameras on back of the phone, we expect to see a 12MP front-facing selfie snapper. Keeping the lights on should be a 4150mAh battery. 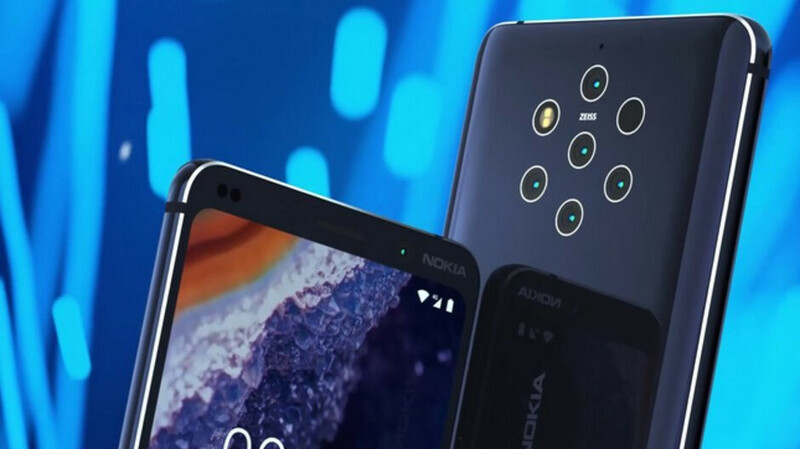 HMD Global, the company that makes Nokia handsets under license from Nokia, gave us a clue last summer that it was developing something noteworthy with the camera on a Nokia phone. In August, the company acquired the rights to the PureView trademark from Microsoft; the software giant acquired the name from Nokia when it purchased the latter's Devices and Services business for more than $7 billion in 2013. The original Nokia PureView handset was the Symbian powered Nokia 808 PureView, which had a 41MP rear-facing camera, astounding for 2012. Huawei set the latest multi-camera trend in motion with the triple cameras on back of the Huawei P20 Pro. The three sensors (which use Leica optics) include a 40MP primary camera, a 20 MP monochrome sensor, and an 8MP telephoto sensor. The Huawei Mate 20 Pro also launched with three cameras, which matched the trio on the P20 Pro with one change. The 20 MP camera takes ultra-wide angle shots instead of the monochrome images on the P20 Pro. Last November, Samsung released the Galaxy A9 (2018) with four cameras on back. The quad-camera setup was the first of its kind and includes a 24MP primary camera with an f/1.7 aperture. A 10MP camera takes telephoto shots while the 8MP camera snaps ultra-wide images. The 5MP camera is used as a depth sensor. The Nokia 9 PureView will be unveiled on February 24th, according to a recently released teaser. The very next day, the Mobile World Congress (MWC) trade show is set to kickoff in Barcelona, and will run through February 28th. Nokia's event will take place just four days after Samsung unveils its 2019 flagships and the long awaited foldable device. Besides the penta-camera setup, the Nokia 9 PureView will have an in-display fingerprint scanner, but will not be equipped with a 3.5mm headphone jack. China's 3C certification reveals that the phone will come with an 18W fast charger right out of the box. And since this will be an Android One phone, it will offer fast updates. Speaking of updates, Nokia says that the device will receive Android Q and Android R. It is pre-installed with Android 9 Pie. Remember when Nokia ruled the smartphone world with phones like the N95 that were ahead of their time? The company may never regain those heights again, but the Nokia 9 PureView could very well be the best smartphone ever released with the Nokia brand on it. As far as pricing is concerned, we could see the device priced in the range of $800-$900 USD. Nothing we haven’t seen before, as far as renders go. Renders notwithstanding, I’m definitely eager to see the Nokia 9 Pureview in action. Should HMD nail the imagery and performance of this 5 cameras-on-the-back beauty, they will have earned my hard earned cash, despite the price not really being my cup of tea. However, I’m just as eager to see the Nokia 6.2 as I am the N9PV. The glass on the Nokia 8.1, while not Gorilla Glass, is still extremely durable: https://youtu.be/vLmxZnXHcms The guy in the video even makes reference at the end to the OnePlus 6T dying from these test, and it has Gorilla Glass. I think the Sony Xperia XZ4 will be the best for stock Android lovers. This runs on last year's processor and we'll have to see if Nokia will ever correct their white balance of their screens. They are always too cold and with no possibility of adjustment. Also the XZ4 should have a nicer design with less bezel and without this monstrous rear design. I came in ready to say "Sony really?" but I've seen the XZ3 in person and wholy crap that is an amazing phone. Easily better than what I've seen so far. The only thing I hate is that it's a little chunky, but I'll take some heft over that monstrosity on the back of the Pure view. I have the XZ3 and I know; it looks much nicer in real, because rather uniquely the front glass doesn't curve only sideways but also up and down and it creates a nearly perfect smooth pebble shape. You have to see it in real to appreciate its design. I think the XZ4 is risking of alienating people with its strangely tall proportions, but still better than this Cyclops rear of the Nokia 9. SD845 is still a great processor. It’s not like it’s suddenly going to become obsolete because it’s last years processor. If that were the case, everyone should throw away their smartphones that have the 845 in it, lol. As for “...the Sony Xperia XZ4 will be the best for stock Android lovers”, I’d say that’s pretty subjective. That’s really up to what the user prefers. Sony makes some great smartphones and are underrated, but I prefer HMD’s Nokia branded smartphones and the beautifully designed rear of the 5 camera toting N9PV. I'm just comparing specs: SD855>SD845, Sony AMOLED>Nokia AMOLED, thinner bezels>bigger bezels. As I already said, apart from stock Android, I think that the best will be Samsung Galaxy S10, but from stock Android warriors, XZ4 wins comfortably the preliminary spec war against the Nokia 9. HMD is using an AMOLED screen here? And if so, how can yuk say Sony’s is better if you haven’t seen the actual screen yet. Bezels are a matter of preference. Only the “thin bezel warriors” are worried about that. And then are the cameras, which neither of can say which will win, but of the cameras are anything close to the 808 Pureview or the Nokia 1020, I’m inclined to say HMD wins here. Seems HMD will have the larger storage option and battery as well, so you can’t say the XZ4 wins the spec war against the N9PV. XD, I don't know wtf this is supposed to be. Calling it chicken scratch would be an insult to the chicken. Lmao says the guy that still hasn’t learned to use punctuation correctly. You’ve clearly failed at grade school. Correcting myself: They are using an AMOLED, but as I said, there is still no way to accurately say which is better until we see the actual thing. And holy sht, I need to type when I'm fully awake, because my comment #17 is a grammatical nightmare lmao. I agree. I find it hypocritical to say that people are saying that you can't say the Sony is better because information about the Nokia phone isn't available, but it's perfectly OK to say that HMD wins here or that it's subjective. No one is saying that it's not subjective. I think the XZ4 will be the better device imo. So where did I say HMD wins? Point it out. Don’t worry, I’ll wait while you move the goalpost back again and change the facts to suit your false narrative. It’s hypocritical to say one wins when all of the information isn’t known about the other. That’s a fact. This could be my first Nokia device since the 1520. (Loved that thing despite Windows Mobile’s issues) Android? Check. Eye-catching design? Check. Awesome specs? Check. (Yeah SD855 would have been nice but my Galaxy S9+ has the 845 and it’s plenty fast for me, so something with a much cleaner UI like the Nokia 9, will absolutely fly on the 845. ) Also, that camera setup is very unique and I’m just aching to see everything it can do. Every time I see these photos I’m just immediately drawn to how frickin slick the camera setup looks. Yeah I wasn't digging it at first but after seeing the renders, I'm liking it a lot. Right! Doesn’t that camera setup look slick AF?! I’m loving it. Great! I can get two then. Nokia phones are improving day by day, New Nokia phones weak point is there camera but looks like they are improving it as well, But the thing I don't like about new Nokia phones is that they dont have Nokia's Touch in it, they don't have that energetic looks which once they had(unique looks, vibrant colors options,) I mean it more felt like old moto phones like original G, X etc. Which is a good thing but doesn't feel like Nokia. I still have and love my lumia 920 even it's camera is worst for use now, software doesn't supported by its own company and processor is far low for today's standard but I love its look and that Nokia's energetic feel which is still in it. I wish they made the bezels smaller but nevertheless i think this will be my next phone! I always had Nokia phones since the 3210. So blow my mind and i will buy one!